Mars will reach opposition again on April 8th, 2014. What can be observed this year? You are at:Home»Non classé @en»What can we see on Mars this year? What can we see on Mars this year? Mars will be at opposition again on April 8th, 2014. Here are some phenomena you must look for! Mars will be at opposition in one month and a half and is already finely observable since its apparent diameter has now passed 10″. It will reach a maximum of 15,2″ from 12 to 17 April (Mars is running on the part of its orbit that is getting closer to the Sun, and so the maximum diameter is reached several days after opposition). This is still a small diameter, only one arcsecond more than in 2012, but this is the last time that northern observers will see it at a correct altitude in the sky until 2020. For those of you that would like to read more on all of this, I recommend you to read some articles published in Communications in Mars Observations (CMO) written either by Masatsugu Minami, Masami Murakami or myself. Links have been added in the article. The northern hemisphere of Mars reached summer solstice (Ls 90) on February 13th (fall equinox Ls 180 will happen next 13th August). So we are going to mostly see only this season this year, northern fall will be best seen in 2016. The north polar cap is reduced to its minimal size. Read on CMO 209 : Thawing Aspect of the 2011/2012 North Polar Cap. We are going to see roughly the same phenomenon as in 2012. These clouds form over the summits of the Tharsis and Elysium volcanoes from Martian noon and continue to spread up to the evening. We will see them through all the current apparition but they should begin to disappear from June when the planet will pass mid-northern summer. Orographic clouds on Mars in 2012 (late northern spring/early summer). At left, the Elysium cloud. 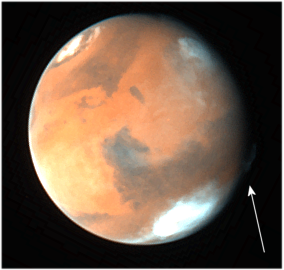 Center : a cloud is forming over Ascraeus Mons. 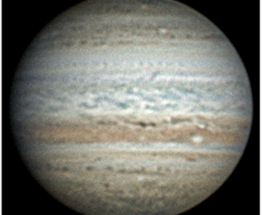 Right : still Ascraeus on the limb but the Olympus cloud is now forming west of it. This is a more subtle phenomenon, but that is observed all round the planet: an equatorial cloud belt that is more adequately designed as “aphelion cloud belt” because it is visible only when the planet is far from the Sun. This is due to the action of a big Hadley cell that rises over the Lion tropic on Mars, and goes down on the southern winter hemisphere. At the highest altitude, water vapor condensates into thin clouds. Amateur map of the aphelion cloud belt in 2012, with Blue images from Efrain Morales, Damian Peach, Christophe Pellier, Yann Le Gall, built by the author through WinJupos. Read CMO 401: The Aphelion Cloud Belt During the 2012 Apparition of Mars. The Hellas basin gets frosty after winter southern solstice. On its ground, temperatures are cold enough to allow the carbon dioxide of the atmosphere to frost into dry ice. The ice will disappear in a few months when the planet will get closer to the Sun. The frost on the Hellas basin (with polar clouds as well) can be seen on those images taken on April 1st, 2012 (Ls 91). At this stage Hellas is a true extension of the huge winter south cap, that we do not see here because the real pole is tilted away from Earth. On the morning and evening Martian limbs, we can often see ephemeral clouds that disappear in the morning, or form shortly before sunset. The most spectacular ones are morning hazes forming inside Tharsis, because they are not only very bright, but they also let the Tharsis summits to poke out through the mist! Evolution of morning fog inside Tharsis in 2012 March. Volcanoes can be seen as dark points inside the mist. 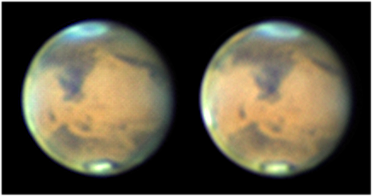 This is only visible after opposition, when the Martian morning can be observed from Earth. Shadowy Summits of Tharsis Montes and Olympus Mons Poking out from the Morning Mist. Here is a more surprising phenomenon that has largely been discussed among amateurs in 2012 (it has been observed before thought, in particular by the HST), and mostly from images taken by Wayne Jaeschke at mid-March. This is a feature that is seen away from the illuminated disk, and that is supposed to be a cloud located at high altitude! 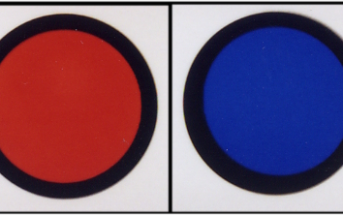 Read on Wayne’s blog: A Martian Stumper. At right: a high altitude cloud observed by the HST in 1999. Season is the same as in 2014 (Ls 104). HST image from April 27th, 1999 (Ls 130). Such clouds begin to form only after Ls 120, which means late April in 2014. 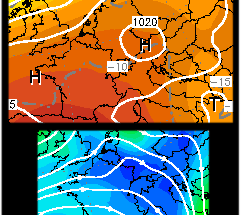 In CMO: A Pre-Polar Spiral Cloud at Early Northern Summer and How about in 2014 Such Cyclones near Baltia Which was Chased in 1999?